1) Tooth protection. Did you watch the big fight? Australian boxer Jeff Horn took the WBO Welterweight title in a bruising match (Congratulations from United Smiles!). But no matter how many blows were traded, at the end, Horn still had the big smile of a winner. Why could he smile? Because he had protected his mouth with a mouth-guard. Child or adult, if you engage in any kind of contact sport, you need to visit United Smiles to get a properly fitted mouthguard. Take good care of your physical health while also protecting your dental health! 2) Cardiovascular exercise. Did you ever think that exercise could be bad for your teeth? It sounds unlikely, but in fact it can be true in some circumstances. Exercising, particularly cardio, reduces saliva levels. 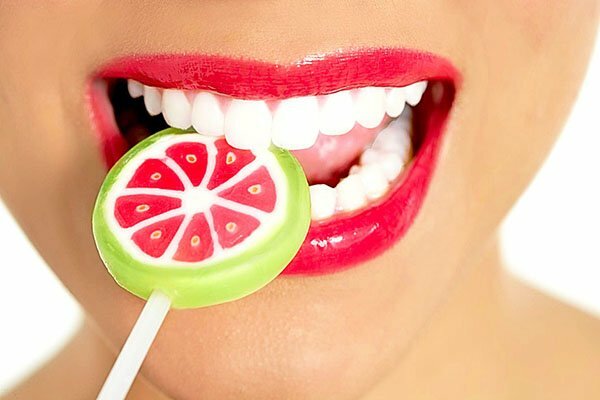 Saliva helps keep the balance in the mouth and prevents bacteria from growing rapidly. Saliva also contains essential nutrients and minerals that supplement your teeth. The best solution to keep saliva flowing is by chewing sugar-free gum while working out and brushing your teeth before exercising. 3) Weightlifting/exertion and teeth. If you clench your teeth while you work out, as many people do, the stress is transmitted through the teeth and the ligaments that hold them in place to the jaw, neck and upper back muscles. Body builders place hundreds of pounds of compressed force on their teeth when they clench them while lifting weights. Clenching can cause damage to the teeth, pain in the jaw and sometimes headaches and muscle spasms. This is another situation that calls for a mouth-guard. 4) The “threat” of brushing after a meal. What’s worse than eating acidic foods? Brushing immediately afterwards. While the enamel is porous, brushing can wear it away easily and make it thinner, reducing the natural protection of the dentin. Instead of brushing after a meal, drink water first and then wait at least 30 minutes after eating for your tooth enamel to remineralise before brushing. Make this wait a habit particularly after eating acidic foods. 5) The “threat” of rinsing. You’ve cleaned your teeth and now it’s time to rinse out your mouth. Don’t do it! When you rinse after brushing you’re washing off the fluoride from the toothpaste left on your teeth and spitting out the excess. 6) The “threat” of overbrushing. When you brush your teeth, you never want to scrub as hard as possible; provides all the abrasion you need. The Wall Street Journal estimates that up to 20% of Americans have damaged their teeth or gums by over-brushing. Your goal is to remove plaque as gently as possible to protect your teeth and gums as you get them sparkling clean. That’s why soft toothbrushes are the safer and healthier option. A hard bristle brush can damage your teeth. A soft brush is best. Using your teeth to help tear or open things. Using your teeth as tools can cause then to crack, break or wear severely over time.Take the time to get a pair of scissors instead of using your teeth for these seemingly harmless tasks. Using your teeth to chew on foreign objects. When we get stressed, some of us chew on pencils, pens, or pen caps. This habit can cause your teeth to chip or crack, and also cause damage to your existing dental work. Using your teeth as an extra hand. Holding knitting and sewing pins, nails and screws, or any other object between your teeth can cause enamel wear and injury to teeth and soft tissue.